Walking is an excellent exercise for fat burning. While any exercise can burn calories, brisk walking for 45 minutes mobilizes the body to dip into fat reserves and burn stored fat. It is especially good for burning internal belly fat, called visceral fat, that not only contributes to your waistline but also raises your risks for diabetes and heart disease. There are two keys to burning fat when walking. The first is that you need to walk fast enough to raise your heart rate into the best zone for burning fat for energy. The second is that you walk long enough that you are burning stored fat rather than just burning off the sugars your body stores for quick bursts of exercise. The fat-burning zone is reached when you exercise at an intensity where your heart rate is 60 to 70 percent of your maximum heart rate. In this zone of exercise intensity, 85 percent of your calories burned are fats, 5 percent are proteins and 10 percent are carbohydrates. The heart rate range for this zone varies by your age. You can use a chart of heart rate zones by age to find the right numbers. Take your pulse while exercising to check your heart rate. There are also heart rate apps for your cell phone and pulse monitors built into many fitness bands and smartwatches. The fat burning zone can be achieved with a brisk walking pace. In this zone, you will be breathing heavier, feeling increased exertion, and probably sweating, but you are still able to carry on a conversation. If you find your heart rate is still below 60 percent of your maximum, work on walking faster by using good posture, arm motion, and a powerful stride. You can also add hills, stairs, or use fitness walking poles. You need at least 45 minutes of walking in the fat-burning zone to get your body to burn stored fat. Walking additional minutes will burn more stored fat. The warmup at an easier pace is an important part of the workout. By spending the first 10 minutes at the lower end of your target heart rate zone you burn off stored blood sugar and deplete the ready energy stores in your muscles. This signals your body that you are going to be doing a longer exercise session rather than a short burst. As a result, your body gets ready to start burning stored fat. If you were to simply start out at your fastest pace, your body wouldn't get this signal. Schedule a 60-minute walking workout to allow for the warmup and cool down time. Walking longer is better, so if you can set aside 90 minutes you will burn even more fat. Beginners should build up their walking time and speed gradually. A beginner's walking plan starts with 15 minutes per day, five days per week, working on good walking technique. You increase your walking time by five minutes per session each week. First, gear up. You will need good athletic shoes that are flat and flexible and have the proper support and cushioning for a long walk. Wear clothing that allows freedom of movement and wicks away sweat. Have a method available to check your heart rate to ensure you are in the fat-burning zone. Start with a warmup of walking 5 to 10 minutes at an easy pace, increasing the speed gradually. Pick up the pace until you are in the fat-burning zone of a heart rate of 60 to 70 percent of your maximum. Check your heart rate every 10 minutes to ensure you are staying in the zone. Continue to walk in the fat-burning zone for 30 to 50 minutes or more. If your heart rate dips, pick up your speed. 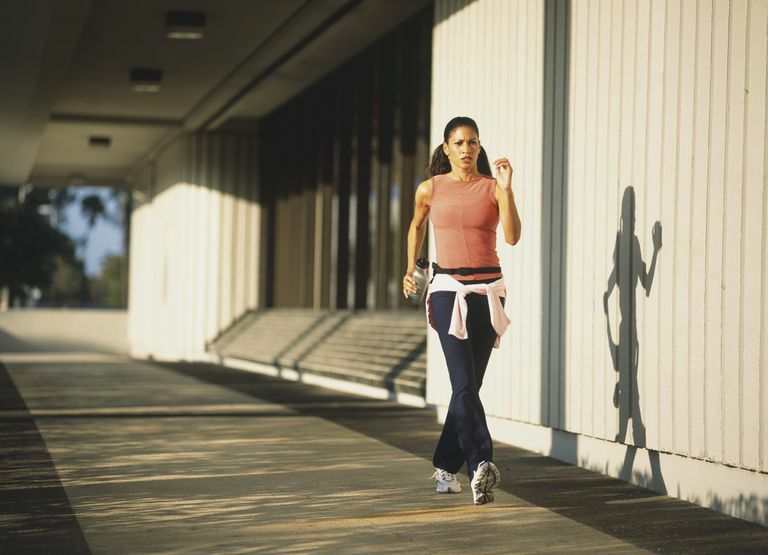 You can even jog if you can't get your heart rate up enough at your walking pace. End with 5 to 10 minutes at an easier pace for a cool-down. If you enjoy a fat-burning walk five or more days per week, you will achieve the amount of exercise recommended to reduce health risks. The fat-burning zone overlaps with the moderate-intensity exercise zone. You can do a fat-burning walk daily or alternate it with intense workout days. If you want to lose body fat, you should do a fat-burning workout most days of the week. Walkers who are training for a distance event such as a half marathon or marathon should walk at a pace that is within the fat-burning zone for their long day of distance training each week. How many calories you burn while walking depends mostly on the distance you walk and your weight, with some slight variation for higher speeds. Tips to burn more calories when walking include tactics such as using fitness walking poles, hills, and high-intensity intervals, and simply walking more miles. If you just don't have enough free time in the day to spend 45 continuous minutes walking, then make the most of the time you have. Find the time to get in two to four 15-minute walks at a brisk pace every day. You will be burning calories and building your walking speed and ability and at least achieving the minimum recommended physical activity level for health. Is Walking Better for Fat Burning Than High-Intensity Exercise? High-intensity exercise does not burn as much fat for energy as moderate-intensity exercise, but the total calories burned in any workout can help those seeking to lose weight. Walking is a great cardiovascular aerobic exercise that most healthy adults can do without equipment or special training, but it isn't the only one. The best exercise for fat-burning is the one that you enjoy and do daily. Other moderate-intensity exercise activities include bicycle riding on level terrain, water aerobics, easy jogging, elliptical trainer, ballroom dancing, gardening, and doubles tennis. You can mix up your exercise routine and enjoy any of these activities. Challenge your body in new ways and balance your muscle development by doing a variety of different physical activities. In addition to burning fat, you are also building muscle and raising your basal metabolic rate. With a boosted metabolism, you are burning more calories all day long. You don't need to spend much money to enjoy a fat-burning walk. Heart rate monitors: To be sure you are exercising a moderate intensity, it is wise to take your pulse as a check. You can take your pulse by hand and use any watch that displays seconds to count your pulse, but a heart rate monitor can give accurate readings continuously. Walking shoes: To walk comfortably at a brisk pace and reduce risk of injury, get fitted for the right walking shoes at a running shoe store in your area. Often, you will find that flat and flexible running shoe models will work best. Walking faster: Learn how to use the right arm motion and foot strike to walk briskly and boost your heart rate. The first step towards burning fat is simply to get moving. Use a quick start walking program to build your walking time, technique, and speed if you haven't already been walking briskly for 30 minutes or more. Taking it easy at first and working on the basics steadily can get you to your goal. Bairapareddy KC, Maiya AG, Kumar P, Nayak K, Guddattu V, Nayak V. Effect of Aerobic Exercise on Echocardiographic Epicardial Adipose Tissue Thickness in Overweight Individuals. Diabetes, Metabolic Syndrome and Obesity: Targets and Therapy. 2018;11:303-312. doi:10.2147/DMSO.S145862. Carey DG. Quantifying Differences in the “Fat Burning” Zone and the Aerobic Zone: Implications For Training. J Strength Cond Res. 2009 Oct;23(7):2090-5. Hong H-R, Jeong J-O, Kong J-Y, et al. Effect of Walking Exercise on Abdominal Fat, Insulin Resistance and Serum Cytokines in Obese Women.Journal of Exercise Nutrition & Biochemistry. 2014;18(3):277-285. doi:10.5717/jenb.2014.18.3.277.